It is very cruel to remove a new born cub from its mother when only a few days old, to be used in an industry only interested in making money, and not the lives of those cubs. Thousands of people visit facilities where they interact with lion cubs. To pet, cuddle and have their photographs taken with a cute lion cub. Thousands of volunteers wish to work at wild life sanctuaries, particularly if they have lion cubs to take care of, to bottle feed, to hand raise. Breeders who charge the public to pet and take photos with young cubs, tell venues and customers many things, including that the cubs will have good homes after they get too big to be used to make money from petting. There is no conservation value in captive bred lions. No captive bred lion has ever been released back into the wild and conservation authorities have made it clear that none will be. 4. Where do these thousands of lion cubs come from? The harsh reality is that they are the product of factory farming. The cubs are taken from their mothers shortly after birth. This causes extreme stress to both the mother and the cubs. The mother is then forced to breed again and again, to produce about 2 to 3 litters of cubs in a year. This is extremely unnatural. 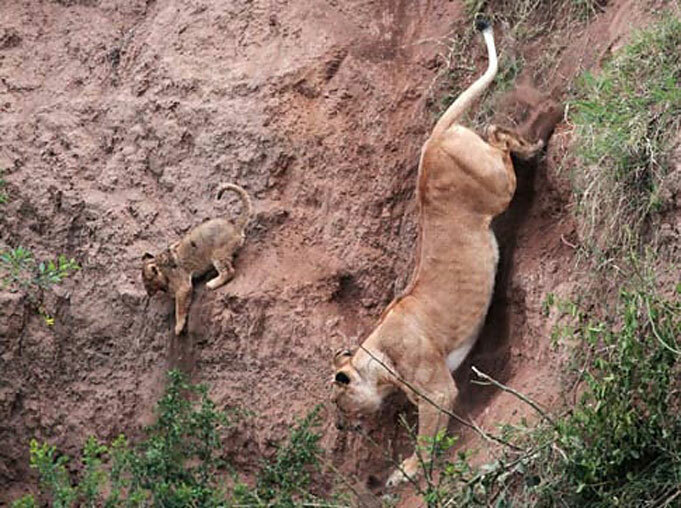 In the wild a lioness will only reproduce cubs every second or third year. 5. What are the benefits in hand rearing a lion cub? There are no benefits at all. 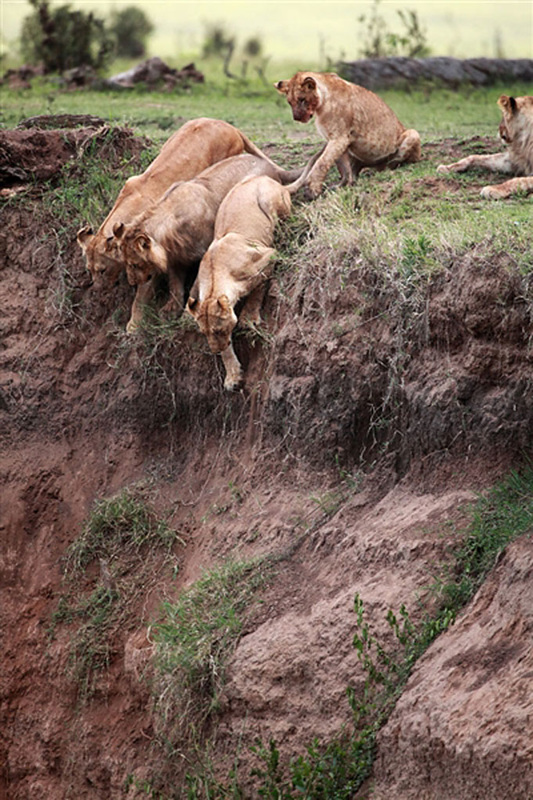 Lions deprived of growing up in a natural social group and hand reared cannot be rehabilitated back to the wild. These inbred, human- imprinted and psychologically damaged animals have absolutely no conservation value. They are bred for one reason only. MONEY. Lion breeders use Volunteers to look after cubs and hand rear them. Volunteers pay lots of money to work at a facility where there are cubs, believing naively that these animals will be reintroduced back to a natural life. They will not. These babies are used to entice tourists to come out to S.A. to have their photographs taken with them. These cubs, once they are able to feed themselves, are rented out to lodges where tourists come to pet and have their photos taken with them. What possible enjoyment can these cubs derive from being picked up, posed with day in and out, until they have grown too big? It is extremely stressful for them, they can lose their fur and get diarrhea. Lion cubs are naturally boisterous so they are often beaten into submission by staff members if they do not behave themselves. No true lion sanctuary allows breeding in captivity for captivity. So there will never be cubs to interact with at a genuine lion sanctuary. Look at how poor the condition is of these cubs. Notice how the hair is falling out. This is a typical result of stress caused by removing babies from their mother at such an early age, unnatural nourishment being given to these babies and constant cub petting. When you indulge in cub petting for the self indulgent purpose of having your photo taken with a cute lion cub, this is what you are doing. Do not believe the blandishments of these lion farms that pose as wildlife sanctuaries, that their lions will not be hunted, will be released back to the wild, will go only to approved facilities that do not hunt, blah blah..
You have the choice to do the right thing. No true sanctuary will have any cubs or allow you to walk with predators. A true sanctuary for lions and other predators will not allow breeding nor will it allow any physical interaction with the cats. This is to protect you and the animals from harmful diseases. Every reputable animal welfare organisation in the world condemns the use of lion cubs, or any wild animal babies, as a human plaything. We urge tourists and volunteers to practice responsible tourism and use their dollars for good and not evil. The cub you petted will not live a happy ever after life. If you are guilty of indulging in any of the above practices, you must do so knowing that the lion cubs that you interact with are from the canned hunting industry and that you are contributing to their terrible lives. Wanton cruelty to animals is offensive to compassionate people all around the world. This industry’s whole business model consists of an endless cycle of routine abuse of helpless animals. Cubs are ripped away from their mothers at birth. They are exploited and used for stressful petting by thousands of tourists. When too old for that, they are used for walking with yet more tourists, and then they suffer an early and violent death. This is not farming or hunting. This is a sick business which must be closed down. Please take this seriously and look at this site https://www.facebook.com/volunteersbeware?hc_location=timeline to understand fully the horror of these breeding farms, or visit lionpetting.com to learn more. Read this article in Projects Abroad by Samantha Evans. It will open your eyes. Cuddling cubs - Discover the darker side of Big Cat "Conservaion". 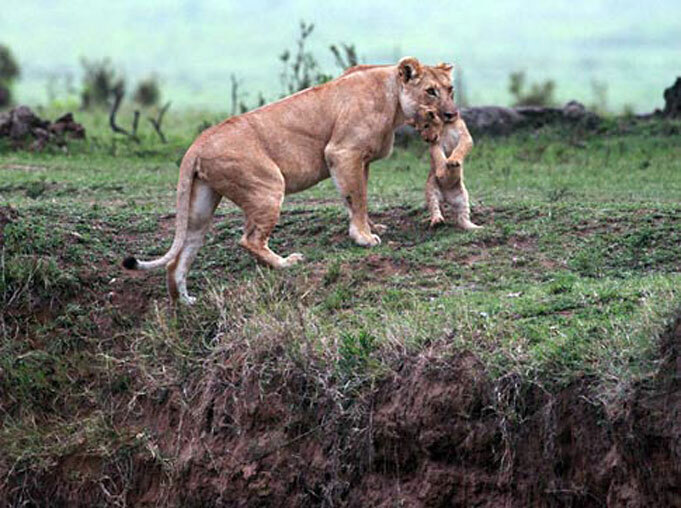 Just as the exhausted cub seems about to fall, his mother circles beneath him and he is snatched up in her jaws, according to the Daily Mail. She then begins the difficult journey back to the top. 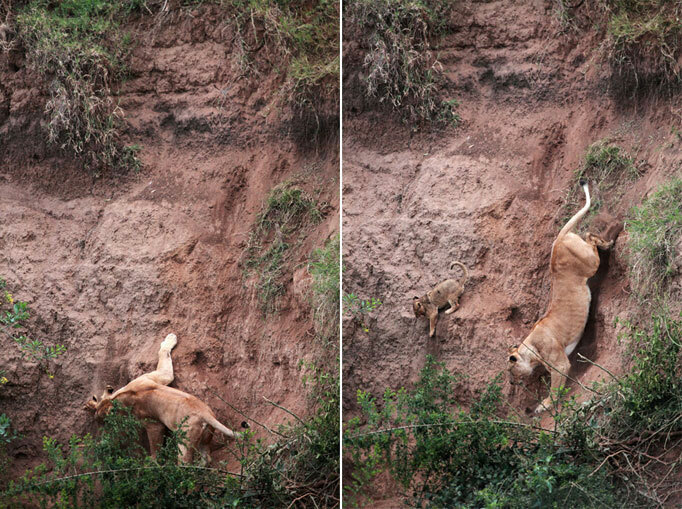 Caught by a this dedicated mother, as the cub slides to a certain death. Being a mother's not all about giving birth, but it starts within the heart. 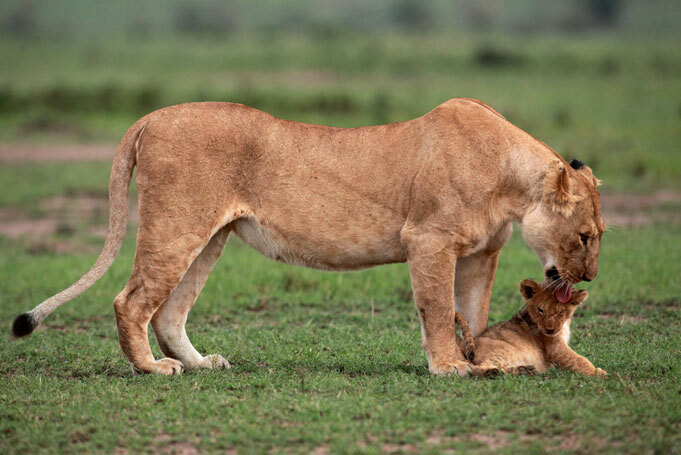 Safe and sound, the lioness gives the cub a big welcome-back lick. This is the reason why the stress to mother and cub when they are separated is so cruel. Cub petting is about cruelty to these sentient animals and only YOU can make a difference if you refuse to be a part of this dreadful industry.